More than 36,000 Graco Table2Table 6-in-1 high chairs sold at Walmart are being recalled after complaints that the rear legs can pivot out of position, and make it unstable. 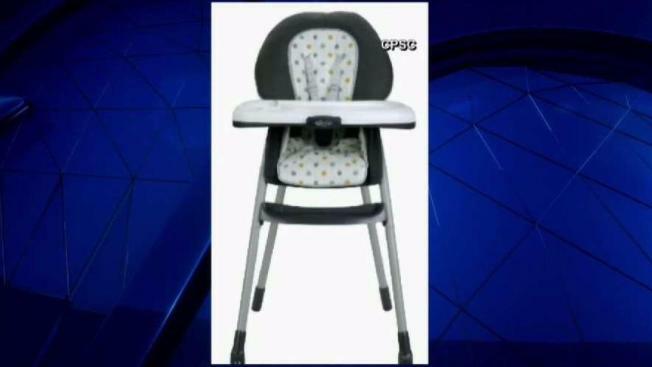 About 36,000 Graco Table2Table 6-in-1 high chairs sold at Walmart have been recalled after at least five children were injured when their chair fell over. The rear legs of the chair can pivot out of position, making it unstable, according to a recall notice posted last week. The chairs were sold at Walmart stores from October 2016 to December 2017. They have the model number 1969721, which can be found underneath the toddler seat and on a label behind the booster seat. Anyone with a chair should stop using it and contact Graco for a free repair kit by calling 1-800-345-4109 between 8 a.m. and 5 p.m. ET on weekdays or clicking here.